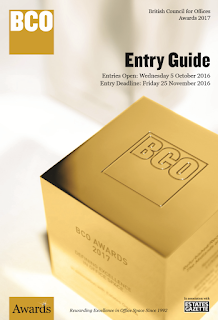 On November 22 2016, over 200 office sector professionals gathered for the first ever BCO NextGen Awards. An event which saw awards being given to rising stars within commercial property and to the people and places that inspired them. Held at U+I's offices in London, young professionals from across the UK gathered to recognise and celebrate mentors, innovative workplaces and inspirational future leaders of the office sector. After several months of nominations, shortlisting and judging by panels of NextGen committee leaders, sponsors, members and BCO President, John Forrester, the night finally arrived to reveal the winners. The BCO NextGen Awards had the privilege of being presented by architect, sustainability champion and TV presenter, Oliver Heath who announced the winners of nine categories: mentor of the year, five regional rising stars, Innovative FitOut, Innovative Workplace and Trailblazer. Read on for details of the winners and pictures of the evening. The BCO and BCO NextGen would like to say a special thank you to our sponsors U+I, Wates, Aecom, Gardiner & Theobald, Aberdeen Asset, Alinea and Faithful & Gould. Nigel Clark (National Judging Chair): "When you answer the 'Judges Questions', make sure you emphasise every noteworthy credential in your submission. Also: focus on people, not buildings and bear in mind that shortlisting may have to be done on the strength of your submission, so make sure it stands out." Stephen Lewis (Scottish Judging Chair): "The occupier as end user of offices is key, so the submission should highlight how the project meets their needs, whether it's speculative (commercial) or let (corporate)." Matt Viall (Midlands & Central England Judging Chair): "It's always great when you see a submission that clearly demonstrates the passion for the project. We look for entries that show that the project team set the bar high from the outset and challenged the 'norms'. And: always include the numbers and check the maths... we do!" BCO's Junior Vice President, Katrina Kostic Samen, shares why wearable technology is such an area of interest for the BCO and its members. The managing partner of KKS Strategy, speaks from the launch of our Wearables in the Workplace report on some of the key issues wearables raise around big data and privacy. For more highlights from the launch, view our round up of live tweets from the Wearables in the Workplace launch on Storify and we invite you to join the conversation on Twitter using the hashtag #wearableswork. Technology moves fast with wearable technology now having an increasing influence on daily life, but what exactly does that mean for the future of offices? How will the increased awareness of health brought by wearables impact employees and employers? And what are the legal and ethical implications? BCO's Wearables in the Workplace report, produced by Arup and Professor Derek Clements Croomes of Reading University, tackles these questions whilst summarising the benefits of wearable technology and its influence on the future of work. Watch highlights from the report launch hosted by Wedlake Bell with key insights from Helen Garthwaite of Wedlake Bell, Katrina Kostic Samen of KKS Strategy, Richard Isham of Wedlake Bell and report authors Professor Derek Clements-Croomes of Reading University and Mallory Taub of Arup. For more highlights from the launch view our round up of live tweets from the Wearables in the Workplace launch on Storify and we invite you to join the conversation on Twitter using the hashtag #wearableswork. Download your copy of the full Wearables in the Workplace report from the BCO website.